There is a wall running along a street. The writing on it is fragmented and cannot quite be made sense of. The image was taken in the middle of the night and a yellow glare was allowed to invade the site, as the wall slipped away at an angle. A shadowy presence barely registered on the shot. This urban setting, one is tempted to say, could be nothing but the scene of a crime. The sinister, uneasy beauty of this work by Shahidul Alam informs other images that are part of his new series, again and again. Others are eerie, otherworldly; and others still, seem familiar yet are anguished, as if the common ground for existence was being subtracted from the picture altogether. Photography is usually taken at face value and recognized as the construction of a factual world, and celebrated as such, for facts possess a no-nonsense value -or so we would like to believe- that will hopefully help us to get things crystal-clear in the mind. The printed image is envisaged and expected, by the many who support this view, to be self- evident, and self-explanatory, too. To transform photography into the art of tracing an absence is not a method that is self-evident, and yet a case can be made for it: the print, which is an image on its physical support, is one more object added to the Traces of Absence world and is often made to stand for what once was, never to be fixed or grasped in the same manner again. But in the images of this series, what is it we are missing that fills us with anxiety of some kind or another? When acutely perceived, an absence stops us in our speech, it wracks and unnerves us; it unsettles themind. Absence, as a matter of fact, can be identified, can be lingered on and felt, but cannot be quantified and any attempts at giving a qualified description of the feelings involved are bound to fail. Whatever one is led to believe should be expected of contemporary photographic work in the documentary mode, this series challenges starkly. Artificial lighting has been used throughout and its effect is not just strange but painful. The series offers no narrative to behold but the images hold together, perhaps because their author finds different ways to remind us that we will not find a place to rest our heads in them. These are nocturnal viewings in a sleepless night. A small time mugger caught red-handed. It didn’t seem a big deal. As the police dragged away the young man, he implored that they not inform his family ‘they don’t know I do this’. He seemed more concerned about his reputation than what the police might do to him. It was when the people in the streets began suggesting that maybe he should be ‘crossfired’ that the terror crept into his eyes. It wasn’t the Rapid Action Battalion (RAB) he had been arrested by, and it was a police station he was being taken to. He had probably assumed that some high up would call the local police station, or that he would pay some bribes, and he’d be out again, soon. If the police cooperated, maybe his family wouldn’t know. But crossfire was something else. He begged and he beseeched, but fear had gripped him. He knew it took very little for things to take a turn. Crossfire. The word has crept into our vocabulary. The identical press releases with only names and locations changed. The mug shots from the photo ops. Frantic family members trying to prevent the inevitable. The corpse at the morgue. The government started calling the dead shontrashis, a word that has different connotations in Bangladesh, from the “terrorists” that the US define. I had been angered when journalist John Pilger, whom I’ve admired, described the initiator of RAB, Moudud Ahmed as a ‘decent, brave man’. The law minister was using the presence of a corrupt police and a corruptible judiciary, to justify a vigilante force that he could control. I wondered whose idea it was. Black outfit, sunglasses, black bandana. An executioner’s uniform. I remembered the constitution of my land. “No person shall be deprived of life or personal liberty save in accordance with law.” Article 32. This was what the law minister wanted to do away with. At least he had acknowledged its existence. The ‘crossfire period’ that Human Rights Watch described as being “Martial Law in Disguise” included two years of a military installed caretaker regime. As democracy returned, the 2008 election pledge struck a chord. To “stop extrajudicial killing, bring the perpetrators to justice, and establish rule of law and human rights” was part of acampaign promise that led to a landslide victory. The new foreign minister promised ‘zero tolerance’ to death in custody. The killings continued, but this time it was denied. “There is no crossfire in the country. It has never happened” emphatically claimed the home minister. The slumbering judiciary woke up and the bench passed a suo moto ruling, asking the secretary of the ministry of home affairs and RAB to explain a particular killing. Earlier in the incident, the family members had implored that their relatives not be ‘crossfired’. It hadn’t helped. The court expressed concern that ‘extrajudicial killings’ continued even after the ruling. The bench was dissolved by the Chief Justice immediately before the date for hearing (9 January 2010) of the government response -apparently for some administrative reasons. So how does a photographer respond? Exposing the facts, presenting one’s arguments well, making sure the information reaches a wide audience, is the best any journalist can do. What is left, when the killings continue? The facts behind ‘crossfire’ are known. Despite the reluctance of many human rights activists and otherwise-active members of civil society to challenge this injustice, people themselves and now even the judiciary have protested. Now that this apparently ‘independent’ judiciary has also been muffled, what is left? The intention of this exhibit was not therefore, to merely submit documentary evidence. There was plenty of that around and it had failed. The show attempts to reach out at an emotional level. To get under the skin. To walk those cold streets. To hear the cries, see terror in the eyes. To sit quietly with a family besides the cold corpse. Every photograph is based on in-depth research. On case studies. On verifiable facts. A fragment of the story has been used to suggest thewhole. A quiet metaphor for the screaming truth. Working with the Peruvian curator Jorge Villacorta and the research team of Momena Jalil, Tanzim Wahab and Fariha Karim, we have tried to create a physical experience that aims to evoke rather than inform. The Google map acts as an interface with the public whereby people can add information based upon their personal experiences, and is an organic repository for local knowledge that rarely gets to surface in the conventional information flow. It is an attempt to continue living as human beings. In the words of a Supreme Court Judge, "It will be suicidal for the nation and the society to allow the law enforcement agencies to decide who should be killed on criminal charges." Due to the intense purpose of denunciation that makes up the images that are part of this exhibition, the opening of the reception in Dhaka was closed down by a police blockade in front of the Drik Picture Gallery . 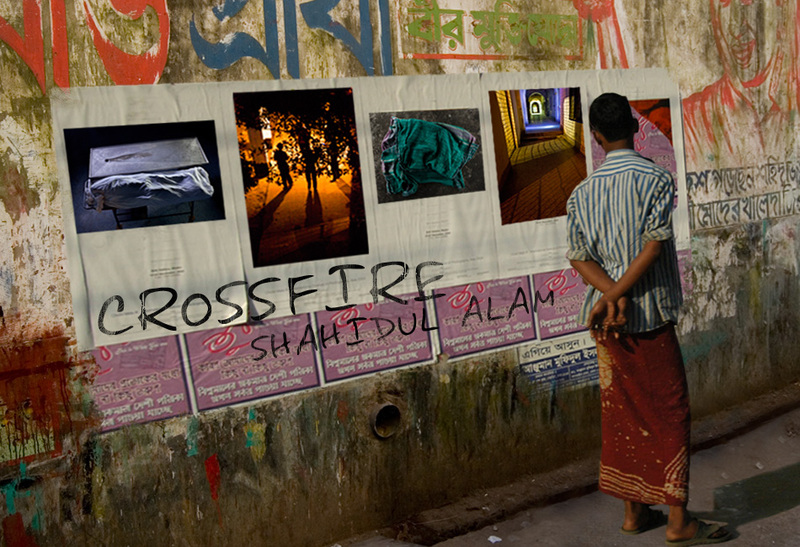 Crossfire, the title of the exhibition, is a term used in Bangladesh to refer to a series of extrajudicial killings carried out by the Rapid Action Batallion (RAB). The exhibition resulted in severe threats against the show's organizers and its supporters. Finally, after a short legal process and with the strongly-voiced support of the international photo community, to which we adhere ourselves, the police deployment had to be withdrawn and the exhibition was finally free of obstructions. In the following links we present additional information to enrich the context of this gallery. The best way to go for you to know the credible Payday Loans Michigan providers. In this section we give only a brief summary recommendation for admission of Cheap Levitra. Full information can be found in the instructions for receiving medications with vardenafil.